How to create a Lesson using the Multichoice Questions: Type 1 Component? Using this component, you can ask a question and give multiple options but with only one possible correct answer. User can click each answer for the given question and find the correct one. You can also place a feedback for each answer. You can also provide links for the answers which will appear in a modal window. 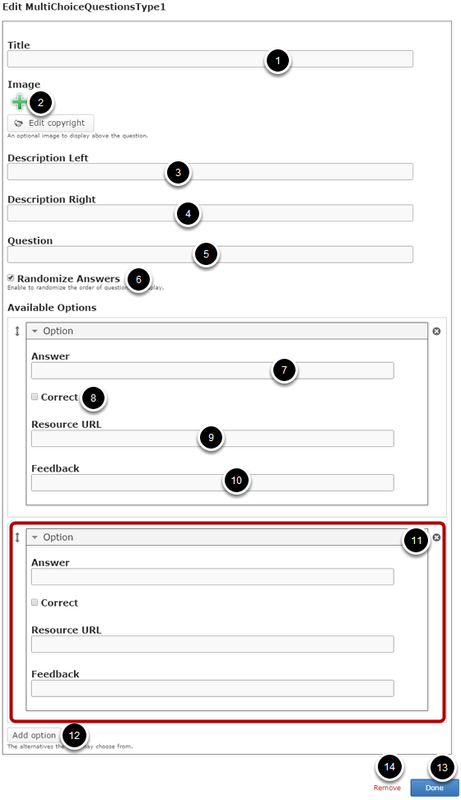 You can use this component when you want the users select only one answer out of the choices for a given question from an answers list. If you want to give multiple choices of answers with hyper links and a feedback for each answer, this is the right component to use. User clicks on each answer for the given question and to find the correct one. If the user has selected the correct answer, it will be highlighted in green. If the user has selected any wrong answer, it will be highlighted in blue. A feedback will be displayed at the bottom for each answer. If user clicks on the text of any answer, the linked page will appear in a modal window. Since the answers are highlighted immediately after you’ve clicked on it, the submit button is not available in this type of question. You can place an optional image above the question. You can place a hyperlink for each answer. The linked page will appear in modal window. You can add any number of answers for a question. Then click on the Multichoice Questions: Type 1 component icon as shown in the above image. You will see a screen similar to the image shown below. You can display an optional image above the question using the ‘+’ icon under Image  title. 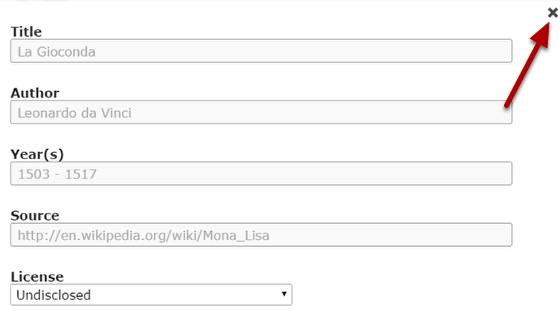 Add the description text or contents on the Description Left  and Description Right  fields. Add question in Question  text field. This field is mandatory and must have some text in it. Add multiple answers in Answer  text field under Options title in the Available Options title. You can add the answers under the Option title. Mark any one of the answers as the correct answer by checking the Correct  check box. Add the resource URL for the answer in Resource URL  field. Add text to the Feedback  field. This field is mandatory and must have some text in it. Remove the component from the page by clicking the Remove  button. You can add an image to the page by clicking the '+' icon under the Image  title as shown in the above image. You will choose an image file. You can also update the copyright details of the image after adding by clicking on the Edit copyright  button shown above. You can enter the image's copyright details on the above screen and click the Close button to update it. Type any description in the Description Left field as shown in the above image. You can also change the format of the text, add and remove hyperlinks and insert horizontal lines between the contents. Please note that this field is not mandatory. Similarly, you can add contents to the Description Right field as shown in the above image. Just type the contents of the page in the Description Right field as shown in the above image. You can also change the format of the text, add and remove hyperlinks and insert horizontal lines between the contents. Please note that this field is not mandatory as well. Start entering the question in the Question field. You can also change the format of the text, add and remove hyperlinks and insert horizontal lines between the contents. Please note that this field is mandatory. You should now have something like the above image. If you click Randomize Answers checkbox, you make the answers display in an arbitrary order every time the page is loaded. This option is optional, and so ticks the checkbox if you need so. Under Available Options, we can add as many answers as possible. Start entering the answers in the Answer fields. 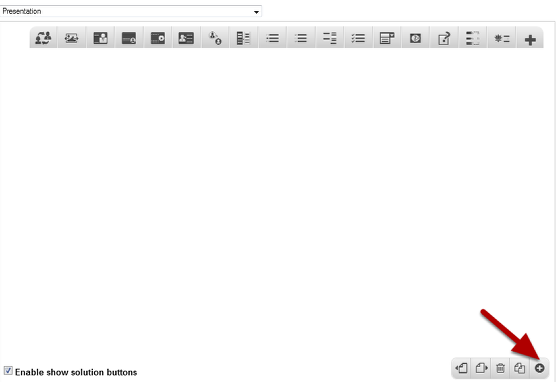 You can also change the format of the text, add and remove hyperlinks and insert horizontal lines between the contents. If the answer is correct, check the Correct  checkbox as shown in the below image. Make sure that you check this checkbox for only one answer. Another Option will be added after you click the Add option button. Similarly, you can add as many answers as you want. You can remove any answer by clicking the X  button on the top right corner of the Option window. You can also change the order of the answers by dragging the Double Headed Arrow  button on the top left corner of the Option window. Type or copy and paste the URL for the answer on the Resource URL field as shown in the above image. When user clicks on the answer, the linked page will open in a modal window. You can also change the format of the title. This field is mandatory. The Feedback will be shown below each answer when the user clicks on answer for question. 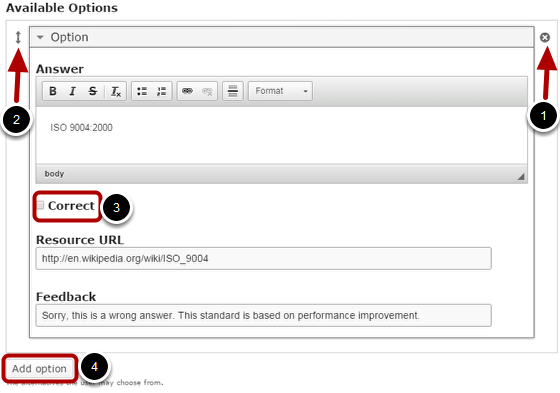 Just type the contents of the page in the Feedback field as shown in the above image. 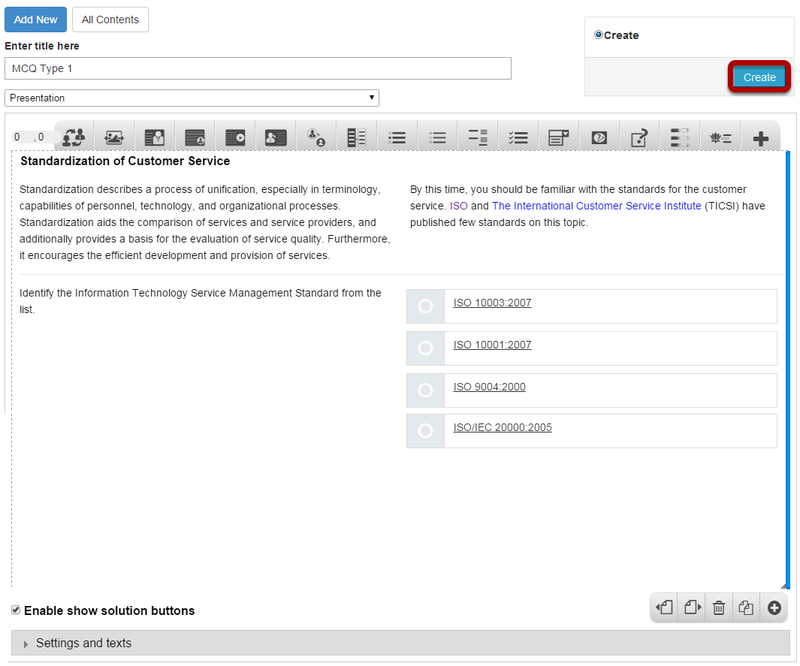 You can also change the format of the text, add and remove hyperlinks and insert horizontal lines between the contents. Please note that this field is mandatory. When the users click on any answers, the related link won’t open in modal window unless the security is disabled. Disabling security differs for each browser. When the user slicks the link, the modal window will appear blank with a security warning depending on the browser you are viewing. In the Chrome browser, the shield icon  appears on the top right corner of the address bar. Click Load unsafe script  link to disable security. The page will be automatically refreshed. Now click on the answer link again, so that the linked page will appear on the modal window. In the Firefox browser, the shield icon  appears on the top left corner of the address bar. Click the shield icon and then click the Options  button. Then click on the Disable protection now option from the drop down menu. The page will be automatically refreshed. Now click on the answer link again, so that the linked page will appear on the modal window. In the Internet Explorer, you will see a warning message at the bottom of the screen. Just click on the Show all content button shown in the above picture. The page will be automatically refreshed. Now click on the answer link again, so that the linked page will appear on the modal window. Similarly, you can disable security in any other browsers to load the linked pages on the modal window. 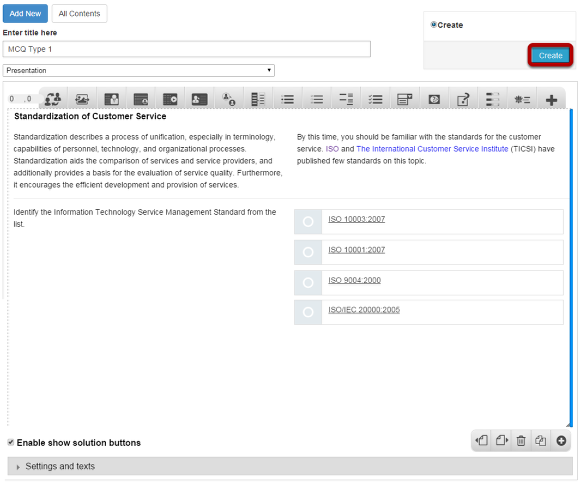 If you don’t want to add a link to the Answer field, type # in that field. This will disable any links in that field.